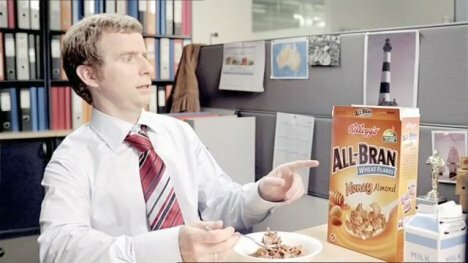 Kellogg’s Australia is promoting All Bran Honey Almond breakfast cereal in the office with a TV featuring Tall Jan. Is this an indication of out of control heightism in the office? In a scene that could easily have appeared in the UK and US TV series, The Office, an office clerk tucks into a bowl of All Bran, much to the surprise of his work mate. “All Bran It’s Delicious”, he says. Up pops Jan from behind the screen. “Tall Jan is malicious?” If the cap fits wear it! Kelloggs All Bran Tall Jan was dreamed up at JWT Sydney by group head Ben O’Brien, executive creative directors Andy DiLallo and Jay Benjamin, copywriter Rob Kleckner, art director Dan Oliva, account team Paul Spriggs and Frances Hockin, and agency producer Amanda Slatyer. Filming was shot by director Robin Walters via Curious Film, Sydney. Editor was Danny Tait. Sound was produced at Nylon Studios.